If there's any human experience more universal than love, it's loss. And that's the exact flavor of optimism explored in the latest film to be adapted from the works of prolific horror writer Stephen King. 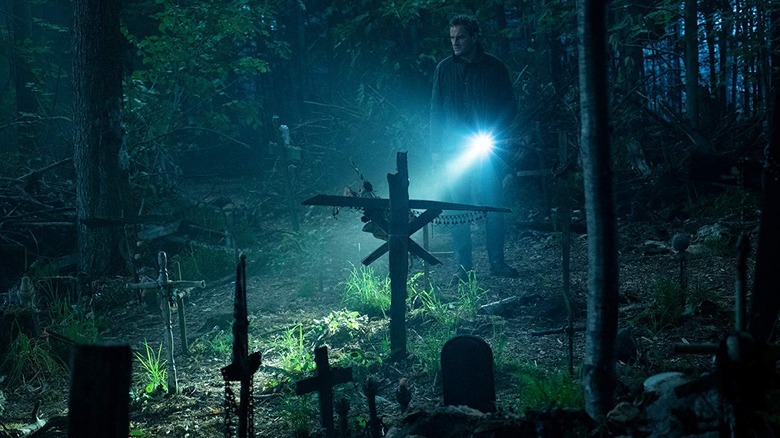 Pet Sematary, an adaptation of King's 1983 novel of the same name, reanimates the classic horror story that was last explored on the big screen in a 1989 film that received very mixed reviews. In recent years, another adaptation of one of King's stories, 2017's It, broke box office records by earning more money in its opening weekend of any horror movie ever. With a huge success still fresh in audience's minds, many were anxiously awaiting this adaptation to see how it would measure up. Pet Sematary opened to relatively good reviews, largely due to a few key themes and moments of crucial character development stood out and really elevated the film. In this piece, we'll be scrutinizing those themes and seeing just how well those moments of development panned out. This is the ending of Pet Sematary explained. Naturally, spoilers ahead! 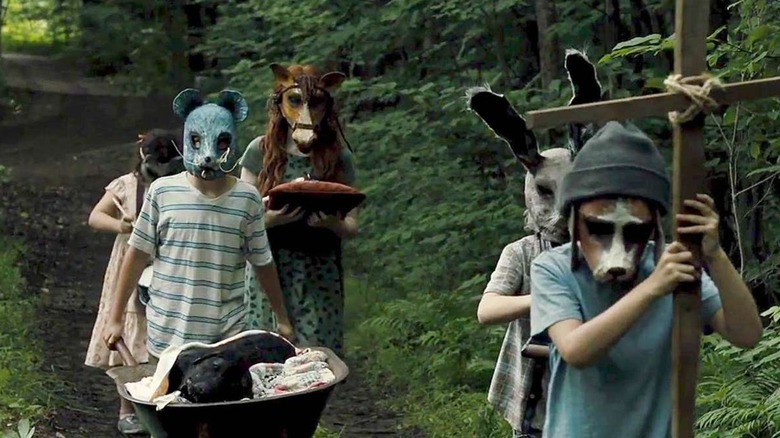 Pet Sematary begins with Louis (Jason Clark) and Rachel Creed (Amy Seimetz) moving from their busy Boston home out to a 50-acre lot in Ludlow, Maine. With their eight-year-old daughter Ellie (Jeté Laurence), their toddler Gage (Hugo Lavoie), and pet cat Church in tow, the Creeds hope to start a more peaceful life in Ludlow. 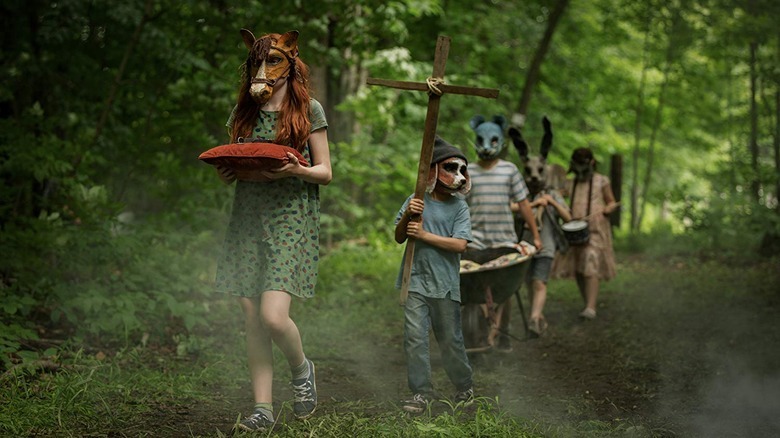 However, this is not possible, as strange rituals are being performed by local children in a cemetery designated for pets that is located on the wooded stretch behind the Creeds' new house. After discovering the cemetery, things quickly go from bad to worse. Shortly after, the family cat is killed by a truck. Ellie deeply loves Church, leaving Louis terrified to break the news to her. Having warmed up to Ellie, the Creed's neighbor Jud Crandall (John Lithgow) shows Louis a burial ground and helps Louis bury Church… who shows up alive the following day, revealing that dead things can be brought back to life using the burial ground. Though things seemingly return to normal after Church's return, it soon becomes apparent that he isn't the same. To the horror of the Creed family, Ellie is killed in the exact fashion that Church was. With the knowledge of the burial ground in mind, Louis revives his daughter, but just like Church, Ellie doesn't come back the same. The family must then come to terms with the fact that some things, once dead, should stay dead. The film's protagonist, Louis Creed, is shown to be blunt and realistic. After the death of the family cat Church, Louis has to break the news to his 8-year-old daughter. For him, sugarcoating the grizzly death of the beloved family cat with lies like "He ran away" is not only disingenuous but something he views as an unhealthy approach to parenting. The film explains that Louis is skeptical of any afterlife and is against planting the idea of one into his daughter's head. In this way, Louis is shown to have a strictly rational mindset when coping with death. He is seemingly unwilling to make assumptions without solid, verifiable facts. This rationalism is what makes Louis' decision to upset the natural balance so surprising. Despite seeing the negative tradeoff of bringing a living thing back to life, Louis abandons common sense in an act of desperation to reincarnate his daughter. Initially, Louis achieves his goal, and Ellie is raised from the dead and returns home. Even though Louis makes a costly mistake in his decision to spend more time with his daughter than is natural, he does come full circle and regain a degree of level-headedness in his final moments. 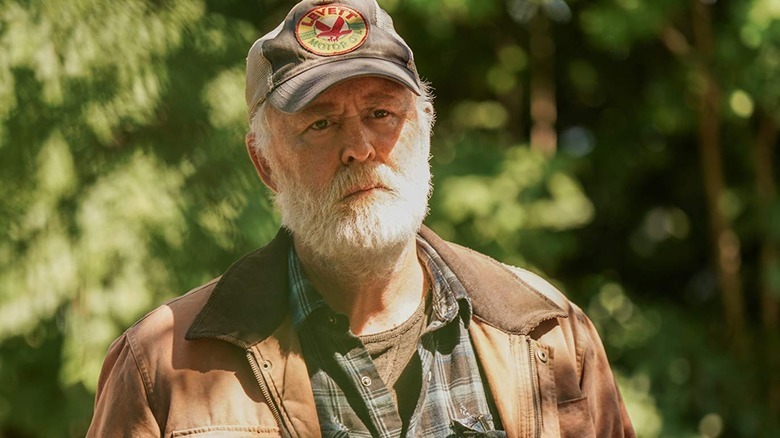 As he fights with his daughter in the Pet Sematary, he faces all that his decision has cost him and decides to take Jud's advice about dead being better to heart, making the painful decision to end Ellie's un-life. Having had a traumatic childhood experience when her sister died, Rachel has difficulty confronting death and wants to protect Ellie (and maybe even herself) from the stark realities of life and how it all ends. When talking about the death of her sister, Rachel says she was able to feel her sister's malevolent presence in the walls of the house. Still being able to hear her sister moving inside the walls and calling out her name, death was never the end of Rachel's relationship with her sister. 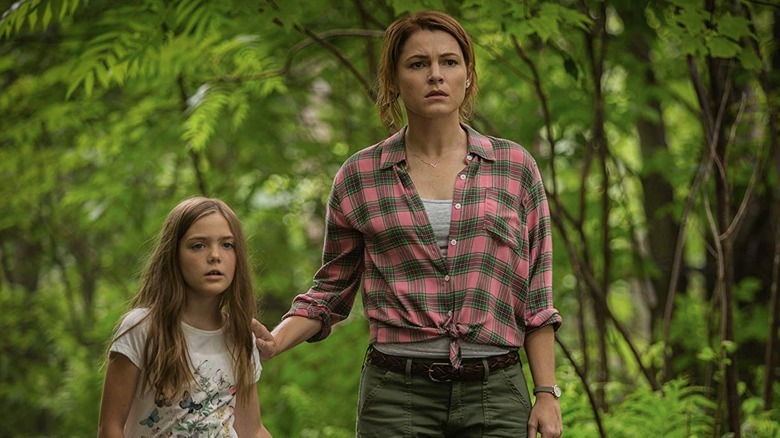 Immediately after Ellie's death, Rachel is unable to face the situation and temporarily stays at her childhood home with her parents, essentially stating that she could feel her daughter's presence still in the house. Despite her initial reluctance to confront death, it's Rachel, not Louis, who first faces reality and accepts that their daughter is gone. While Louis gradually becomes less able to cope with death, Rachel becomes the more grounded of the two and speaks out against Louis for going against the natural order. After saving Gage from Ellie's murderous rampage, she concludes her journey by stating that the undead Ellie is not her daughter, since her child is dead — completing an arc that takes her from someone who believes that their inaction caused immense harm to someone who sacrifices themselves to save another person. Unlike Louis and Rachel, Jud has been living with the knowledge of the magical burial ground for most of his life. As a boy, his childhood dog Biffer was mercifully put down by his father after cuts he got from walking over barbed wire became infected. Distraught, Jud made the fateful decision to bury Biffer in the land beyond the sematary. However, the dog was not the same when he returned, and his father had to put the dog down once more after Biffer became aggressive. Despite having this experience as a child, Jud claims to believe that Biffer's aggression was because of a longstanding mean streak. He believed bringing the dead back could stop Ellie from grieving the loss of her cat the way he'd done for Biffer, but after hearing about how Church changed after he was brought back, Jud is able to realize that the dead may come back in the same bodies, but they're certainly changed by their experience. In spite of the seemingly complete narrative surrounding Biffer, Jud's personal journey is a bit of a mystery, since his wife comes back through Ellie to haunt him and alludes to grievances that remain unexplained in the film. This added story element introduces a sizable wrinkle to the image of the wise man doomed to see his advice go unheeded. Ellie inarguably goes through the most change throughout the course of the movie. She starts out as a curious, friendly 8-year-old who loves her cat and enjoys the company of her new friend and neighbor. After Church comes back from the dead and becomes aggressive, Ellie begins to feel isolated and asks her father to move back to Boston, but the real changes come during her ninth birthday party when she dies. That night, Ellie is resurrected by her father, and nothing is ever the same again. She has seen the black nothingness of death and claims to have experienced the pain of the afterlife. Now, Ellie makes it her mission to kill all those around her so she can resurrect her family. As she carries out her nefarious plans, she displays an impressive array of abilities gained since she made her return from the grave her father dug for her in the Wendigo's woods. She seems to be able to channel the spirits of others who have died — she does this once with the spirit of Jud's wife and once with her late aunt's spirit. Another interesting ability she seems to have gained is the ability to move with impressive speed. Despite all this, Ellie is able to accomplish her goal of feeling secure in her family by the end of the film. 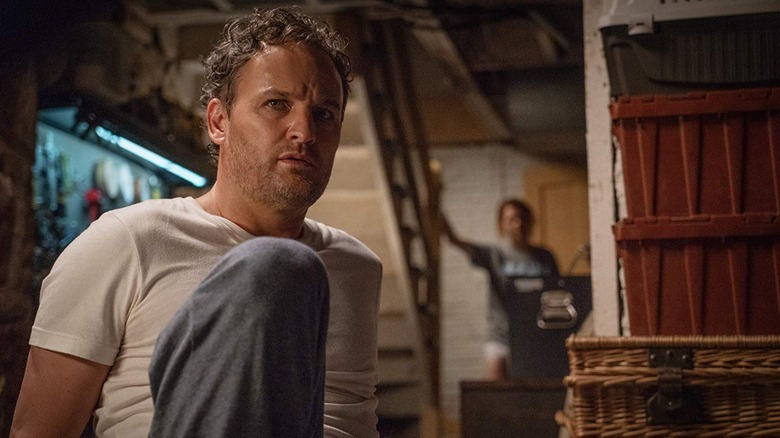 Pet Sematary places a heavy focus on death and the emotions associated with it. The grief of losing a loved one is showcased in the main characters: Rachel and Louis grieve for their daughter, and while she is alive, Ellie experiences the loss of a pet. In these examples, the film manages to explore all of the five stages of grief: Denial, anger, bargaining, depression, and acceptance. For Louis, his grief is expressed by denial and, at some points, anger. He does not accept that his daughter is gone forever and decides to resurrect her, showcasing classic denial. Ellie shows a depressed disposition after Church is left in the road by Louis when he tries to get rid of the undead creature. When Rachel talks about her sister, she starts to tell Louis that if she had only brought her sister her meal in person that things would be different. At this point, Rachel shows that she's stuck in the bargaining stage of grief. However, once she's confronted with an undead daughter trying to kill herself and Gage, her demeanor is much more in line with an angry form of grief. Jud seems to be in a stage of acceptance saying that what is dead is best left dead by the time the Creed family meets him. The film frames this as the desirable mindset to have for lost loved ones, perfectly mimicking the five stages. 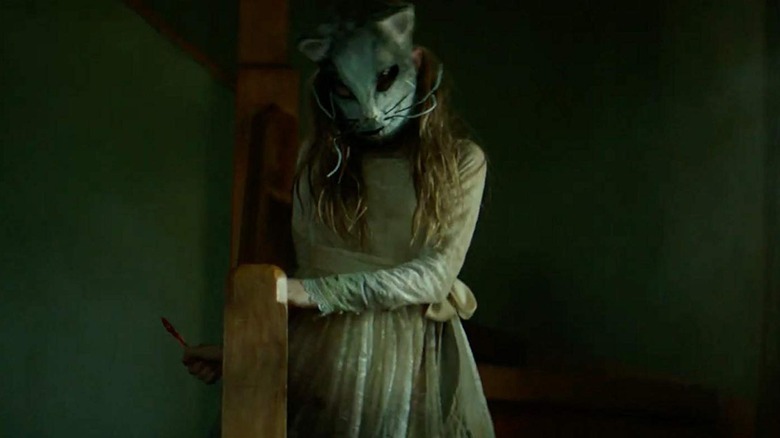 From to the abusive mother in Carrie to the reverend in Revival, a common trope in Stephen King's works is religion and religious symbolism, and the 2019 adoption of Pet Sematary is no different. At the beginning of the film, Louis and Rachel are shown to have theological differences when they have a brief disagreement about the existence of an afterlife. Later, after Ellie is brought back to life, she mentions when she was dead she'd been to a hell-like afterlife and threatens that heaven does not exist. Additionally, when Ellie first returns to life she describes her being dead as "going black" and later exclaims that she never wanted to be brought back to life, an odd statement for someone supposedly suffering in hell. In either scenario, Pet Sematary goes against the commonly held Judeo-Christian concepts of heaven and hell. Besides the discussion of an afterlife, some could claim the name of the family cat is a signifier of Stephen King's views on organized religion. The first evil domino that falls before this family meets their unnatural, grisly end is the insistence on keeping Church a part of the family; other religious symbols, such as crosses, appear frequently throughout the film. Louis may have revived his lost daughter, but the ritual doesn't come without a heavy price. When Ellie returns from the grave, she's a shell of her former self. The once-outgoing girl is now reserved, serious, and most of all, ominous. Very quickly, Ellie's behavior turns violent, and it becomes apparent that the girl who returned may look like Ellie, but the cheery, lovable child she once was is now gone. Pet Sematary is abundantly clear in its message: The laws of nature should not be broken. As much as we might want to bring back a deceased friend or family member, the dead are meant to stay dead. Because Louis is unable to accept the loss of his daughter, everything begins to spiral out of control. He is so focused on his grief that he forgets the simple fact that she can never truly return. Had he come to terms with his loss, he and his family would have been able to cope and regain some amount normalcy in their everyday lives. Instead, the inability to face reality leads to destruction. The film showcases the perils of avoiding hard conversations and even harder emotional challenges. In Stephen King's novel, the Wendigo plays a largely important role in the overall narrative. The Wendigo is an evil spirit that brings the dead back to life and then possesses the body of the reincarnated person. It is also the Wendigo that lures those suffering from grief to the the burial ground, prompting them to return their loved ones to life. In an interview with Slashfilm, when asked if the Wendigo was originally planned to be shown in the film, screenwriter Jeff Buhler replied, "There isn't anything you could think of that we didn't try once." Outside of a passing reference and a few eerie sounds in the woods, Pet Sematary omits the Wendigo entirely. The Wendigo might not make a physical appearance in the film, but its presence is certainly implied. It is strongly hinted that the Wendigo is the cause of the magical resurrections going on. Jud says that the woods feel like they belong to something else (despite the Creed family buying 50 acres of the wooded land). 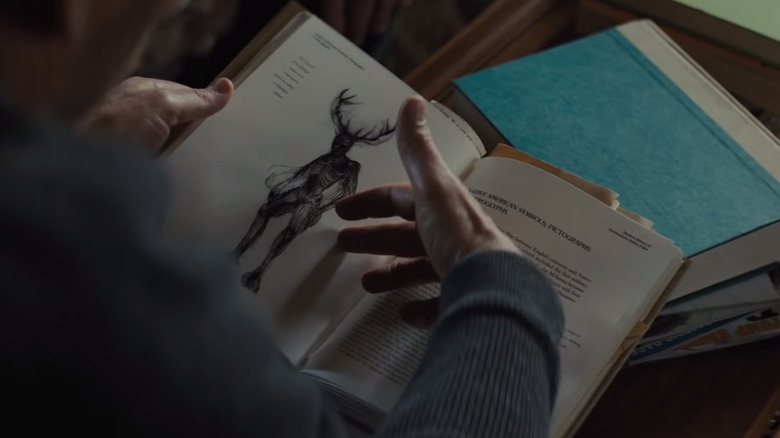 Although ambiguous in their origin, several animalistic cries are heard coming from the woods throughout the film, and it is heavily implied that at least some of these are made by the Wendigo. With many horror films that gain even a modicum of financial success, studios tend to expand on those titles and create new series with multiple entries. This trend can be seen in most major horror films of the past few decades from Scream, to Saw, to Paranormal Activity, and The Conjuring, just to name a few notable examples. 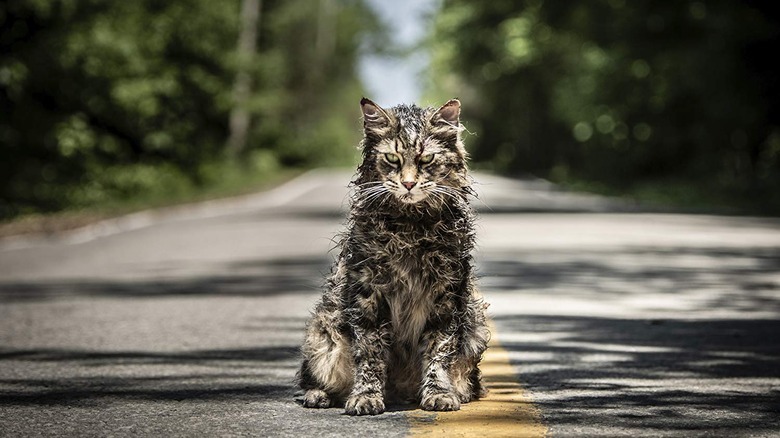 With that in mind, there is no reason why studio heads wouldn't want to see another Pet Sematary movie if this one does well at the box office. The only thing getting in the way of that plan? The film's rather resolute ending. Getting around this obstacle is something that the film's producer, Lorenzo di Bonaventura, has discussed in an interview with Consequence of Sound. According to di Bonaventura, there may be room to make more Pet Sematary films in the form of prequels. There are a lot of stories that could be explored in the town, from local legends to experiences like Jud had as a boy with Biffer, to exploring the sinister Wendigo in more depth. The town of Ludlow is filled with more than enough history to supply filmmakers with interesting material to make a prequel.